The National Climate Change Competition (NCCC) 2013 was launched on 19 February 2013. Currently into in its third year, the NCCC was conceived as part of the National Climate Change Secretariat’s outreach efforts to raise awareness on climate change among youths in Singapore. 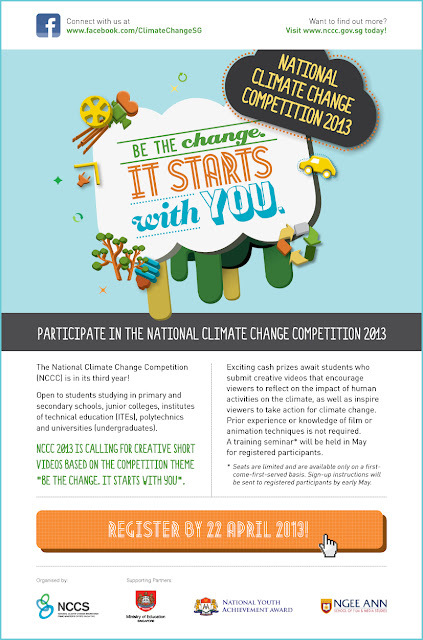 NCCC 2013 aims to garner short videos that inspire Singaporeans to take action on climate change. The theme “Be the Change. It Starts with You.” conveys to youths that they have an important role to play in inspiring and influencing their peers to understand that their daily actions have an impact on the climate. Interested individuals and teams must register their interest via the registration form on www.nccc.gov.sg. The closing date of registration for this competition is Monday, 22 April 2013. More details on the competition can be found here http://www.fas.nus.edu.sg/docs/pdf/undergrad/National%20Climate%20Change%20Competition%202013.pdf or at www.nccc.gov.sg. Should you have any questions on the competition, kindly send us an email at NCCS_competition@nccs.gov.sg.